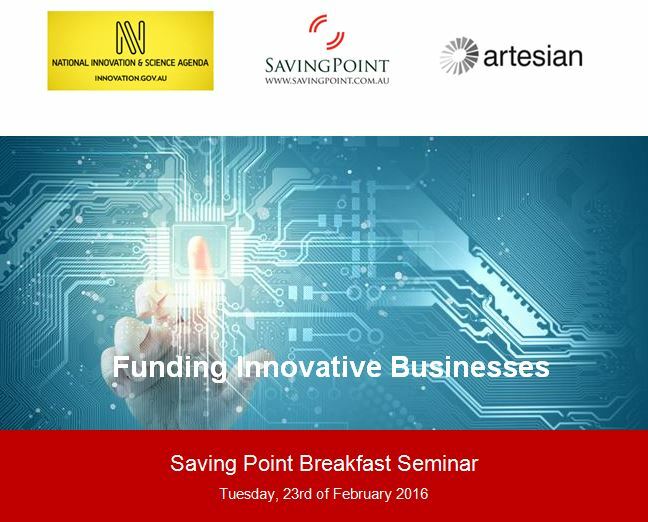 On 23rd February 2016, Saving Point is holding an interactive seminar to discuss government funding and private investment opportunities for Australian businesses. We will be providing the latest case studies for illustrative purposes. Russell is a R&D Tax Incentives and government funding specialist with extensive experience as an advisor in a diverse range of industries, including IT, manufacturing, engineering, mining and property. As a Director at Saving Point, his expertise and knowledge in the area of grants and funding has enabled Australian businesses to obtain millions of dollars of government funding to further their growth and development. Russell is registered with the Tax Practitioners Board, is a Solicitor of the Supreme Court of NSW, and holds degrees in economics and laws from the University of Sydney. He is a regular presenter to professional and industry associations. Tim is the Chief Operating Officer at Artesian Venture Partners. Artesian is an early stage venture capital and fixed income funds management business with offices in offices in Australia, Singapore, Shanghai, New York and London. Through his work at Artesian, Tim is able to assist in the investment in a diverse and exciting range of start-up businesses throughout Australia. Tim employs a professional philosophy that emphasises innovation and efficiency, so rather than adopt the traditional stock picking VC approach, Artesian has built Australia’s first AFOF. This will invest in as many as 1,000 Australian start-ups over the next 5 years. Ron & Joe are Commercialisation Advisors with the Federal Government’s Entrepreneurs’ Program. They have over 50 years combined experience in a variety of industries and are experienced business builders who understand the challenges of commercialising new IP. Both Ron & Joe have successfully operated within the technology and start-up sectors throughout their impressive careers, and have extensive experience in business development and the commercialisation process.